Chris Butler co-authors "Climate Insecurity & Conflict in South Asia"
Home / News & Events / News / Chris Butler co-authors "Climate Insecurity & Conflict in South Asia"
Chris Butler, a Sociology PhD candidate, co-authored "Climate insecurity and conflict in South Asia: climate stress as a catalyst for social conflict and environmental insecurity". Chris worked for three months in Nepal working on earthquake reconstruction with International Medical Corps. Towards the end of his dissertation reserach period, he was invited to co-author the book with some researchers from the Nepal Centre for Contemporary Research. Climate change has emerged a central and undeniable issue for nations as its effects are causing environmental damage that triggers enormous human insecurity and conflict around the world. South Asia in particular has been identified as one of the more high risk regions of the world when it comes to climate change and its impacts. 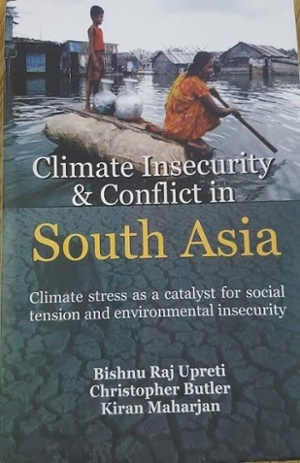 Though some scholars and policy makers contend there is no concrete evidence of a correlation between climate change and conflict, we compile compelling stories that connect climate change effects with human insecurity and conflict in South Asia. Using five years of research, looking at media and scientific reports from Afghanistan, Bangladesh, Bhutan, India, Maldives, Nepal, Pakistan and Sri Lanka, we document ample evidence that climate stress has become a powerful catalyst for social tension and insecurity. Erratic climate events (e.g., 2010 floods in Pakistan and 2012 flood in North India and Nepal) as a result of climate variability have impacted millions of livelihoods throughout South Asia and rendered billions of dollars in damage on homes and national infrastructure. This book documents that when climate stress causes insecurity among people, the situations can be manipulated for political ends, and often results in social conflict. Hence, it is important for South Asian nations to work together in the framework of environmental security to tackle the challenges arising from the climate stress. In this context, this book provides a framework of analysis of environmental security to deal with the causes and consequences of climate change.